Updated to prevent crashes on Windows Vista SP1. I got to try this out while it was being developed, and it has turned out awesome! Thanks for the cool player, Dani. 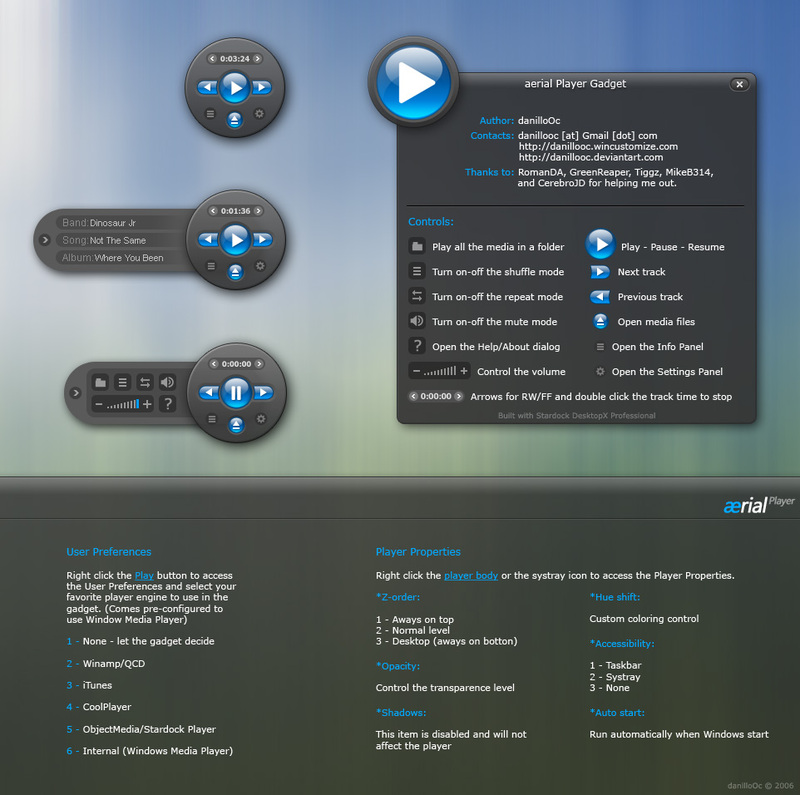 I was so suprised when I used this to see it worked with WinAmp not that DesktopX integrated media player. I think I might use this even more then I predicted! Excellent! One question: When playing a CD there is no info for "Band" or "Album". In "Song" I get the band followed by the song. Is there a setting I'm missing? Thanks. Any chances for a player like this, but working with Foobar2000? Anyway it's awesome, both player and WB. OK... I've had time to play with this a while now. And I have to say. AWESOME!!!!!!! Coolest media player out there. Very cool looking, without all that stupid extra crap... (visualizations, etc.) Just magnificant. Thank you, thank you, thank you! This suite is so far incredible. I hope lots more skins to match are still to come. I love this! But for some reason this puppy won't play for me. As long as you have R1CH's Winamp Spam plugin, this works just like it does with Winamp. It doesn't break the information up, but will control and have one line that scrolls artist - title- album. I hope this doesn't seem petty Dani, but is there any chance at all for an actual Widget version of this? The only reason I ask is because Gadgets don't respond to F9 (to jump to the front) or F10 (to hide completely). Those are two of the most useful functions, for me at least. Brilliant work, and many thanks for the Gadget, nonetheless. Awesome ! Is there any way to have a playlist and cover (pic in the folder of the played mp3) in it ? Very well done, smooth and simple. Using this now...excellent work, and just the right size too! Man, congratulations! Great and amazing work, this realy deserve a great score! 10 stars from me ! Only one thing I'd change about this:: I'd get the font for the info panel to match up with the rest of the theme. It doesn't look too great compared to the rest of it. Works perfectly with iTunes, too.